The Star is a new six-star, 60-level hotel and residential tower.  The competition winning design features a pair of gently adjusting tower-forms, slim at the base, that taper outward at the top. This is an organic responsive architecture formed and shaped by the line of winter sun into public space and parks, curved to reduce wind effects and optimising amenity, access to harbour views and sunlight for the occupants. It is a sculptural architecture that will appear as a white and uniform series of layers articulated at each floor. The external low-iron sheet of glass of the facade system will provide clear vision to a layer of automated fabric giving veil-like delicacy to the sculptural surface. 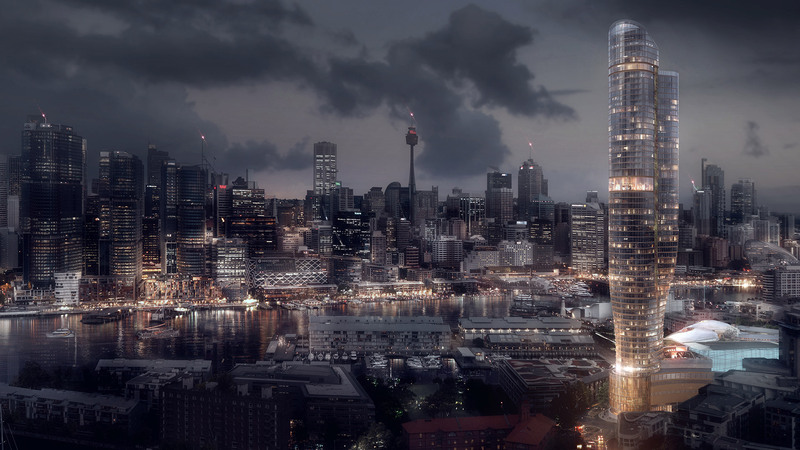 The Star will become an iconic landmark for the City of Sydney, responding to the unique identity of its place. Pyrmont is a special and integral part of the city, rich in history and character. 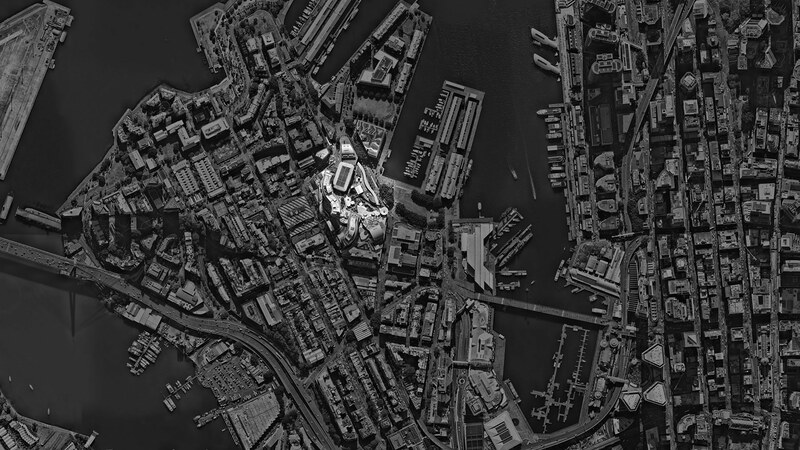 The design seeks to create a landmark that relates to the natural landform, topography, heritage and sandstone foundation of Pyrmont; it also relates to the gentle, organic forms of the harbour, enhancing and supporting the public spaces and local community while creating an exciting destination for all. This is to be a landmark of sustainability, not only in terms of the strategies to achieve the highest Greenstar rating, but also through adopting a biomorphic approach to the architecture where the systems are organic in character and integrated into the architecture. The integration of natural landscaped bio-filtration gardens is an example of this approach. Located at the prime northern end of the site, with views to parklands and easy access to Darling Harbour, Pyrmont’s new Community Lounge and Resource centre will provide the amenity and resources for a continuously growing high density city suburb. The proposed Community Lounge and Resource Centre will provide contemporary learning centre resources, lounge space to escape the pressure of high density living plus a range of spaces for community hire. This facility will be highly flexible and can be adjusted to meet the community needs. At ground level, a street aligned lounge and technology hub and enterprise cafe is proposed with breakout to a sun drenched terrace. This is envisaged as a vibrant and transparent community space offering comfortable lounge areas, space for small exhibitions and public access computers. Direct access is provided to the library annexe above via stair and lift. The level 1 annexe will offer a limited library collection plus lounge and learning commons. The upper two levels offer space for community and private Pyrmont resident hire. There are open plan spaces for casual groups (knit and natter, casual computer training, youth and children’s programs), makerspaces as well as a series of more cellular spaces which can be used for smaller group work and consultations. The upper level is a dramatic double height function space which can offer venues for larger classes, community parties and community ceremonies. Other options for space usage (for Level 2 or 3) may include City of Sydney sponsored co-working space or Business and IP centre to assist business start-ups, which would suit the 30-something professional demographic. In total the proposal will offer 1333 sqm of high quality, centrally located community space over 4 levels enhanced by a new civic space, northern orientation and a wonderful aspect. The gentle curved facade of the community building matches the height of the adjacent sandstone escarpment, and is clearly independent and articulated as a welcoming public building. A double-skin facade encapsulating operable timber louvres, create a warmth and inviting community architecture. The façade of the Community Lounge and Resource Centre is a wide ventilated cavity system incorporating large operable vertical shades. The external face is a shear glass wall on timber mullions. The internal face has large operable windows to facilitate access to this cavity. The material of the ground-plane, street-frontage built forms, pavilions and tower podiums is to be Sydney sandstone, detailed with depth and solidity. Deep louvre screens in sandstone and newly profiled precast provide a balance of transparency and solidity, shade and view, while the curvilinear lines of the stone sits above areas of transparent glazing to activate the public domain. 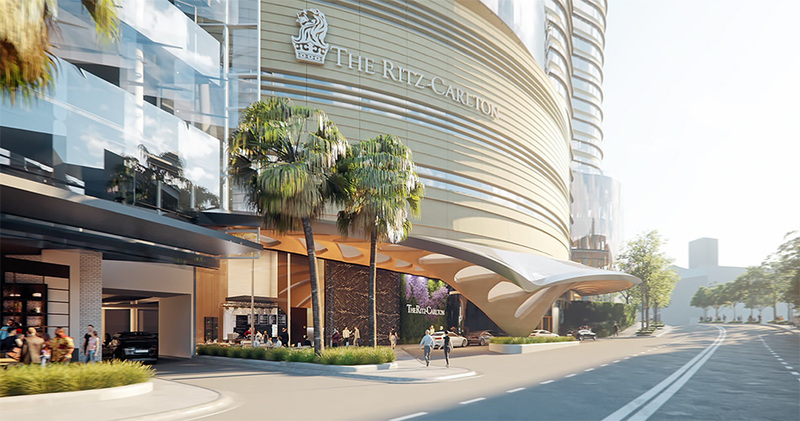 This new Ritz Carlton Hotel Building will be a similar public landmark destination for Sydney. 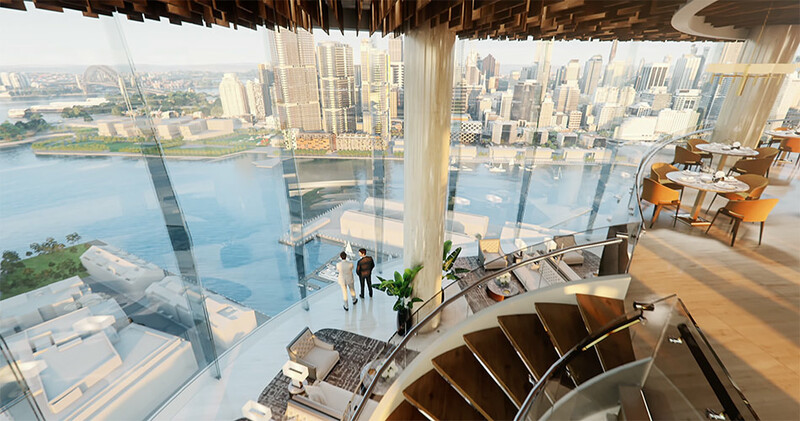 Its public spaces and grand rooms, bars, restaurants, facilities and dramatic views to the Harbour and City will make it an incomparable destination.